Trumark Homes co-founder Gregg Nelson recently announced the company sold out a 134-unit residential development in Milpitas known as PACE. “PACE represents the fourth Silicon Valley project in Trumark Homes’ portfolio, and we continue to target project sites throughout the region, which is experiencing an unprecedented demand for housing as a result of the thriving San Francisco Bay Area market,” Gregg told Bisnow. Trumark teamed up with Resmark Land and Housing to complete construction. Resmark chairman and CEO Robert N. Goodman praised Trumark’s ability to execute on the vision. “Resmark and Trumark enjoy a long-standing partnership, and we look forward to continuing the relationship in the future,” Robert added. The PACE development consists of two communities: detached single-family units at Velocity and townhomes at Momentum. Trumark hopes to attract established Silicon Valley families as well as first-time homebuyers with a tiered pricing model, Gregg said. The project was screened to ensure the market had a record of strong and sustained job growth, proximity to transit and offered a range of pricing options, the company reports. PACE is near the Montague Expressway and the Milpitas BART station. Want to learn more about what’s going on in Silicon Valley? Join us at our Silicon Valley State of the Market event Sept. 15. With median home prices in San Francisco hovering near $1 million, developers are looking to the far reaches of the Bay Area and beyond in search of affordable land on which to build. And buyers are taking the plunge, sometimes in places as distant as Sacramento, more than 80 miles from the city. 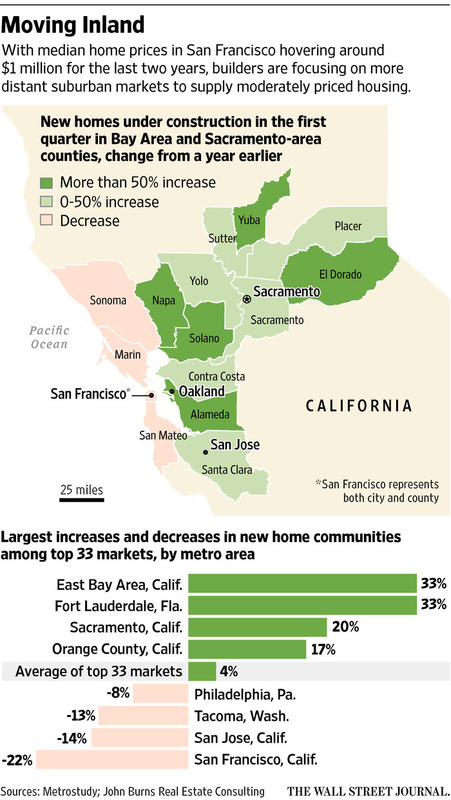 Over the past year, the East Bay, which stretches 10 to 60 miles to the east of San Francisco and Silicon Valley, is tied for the fastest growth in new-home developments among major U.S. markets. Sacramento came in at number three, according to figures from John Burns Real Estate Consulting. By contrast, the number of new residential developments in coastal San Francisco and San Mateo counties fell by 48% over the past year, while San Jose, which includes Silicon Valley, fell by 59%, according to the data. Expensive and increasingly scarce land has made it difficult for developers to build houses most people can afford in the core Bay Area. Among all U.S. counties with populations over 500,000, the 10 most expensive for home purchases include five in the Bay Area, according to data company RealtyTrac. Steve Maloney now commutes to the Bay Area every week from his home east of Sacramento, a nearly 120-mile journey across six counties. He and his family used to live in Marin County, across the Golden Gate Bridge from San Francisco, but they grew tired of the congestion. Two years ago they moved into a new 4,600-square-foot house on 3 acres for $920,000. Some Bay Area builders are still nursing wounds from the housing crash, when far-flung California markets such as Stockton, Vallejo and Sacramento skyrocketed on loose lending and speculative fever—only to plummet in an epic bust. While the pace of new construction in faraway suburbs is quickening, it is coming off historically low levels. 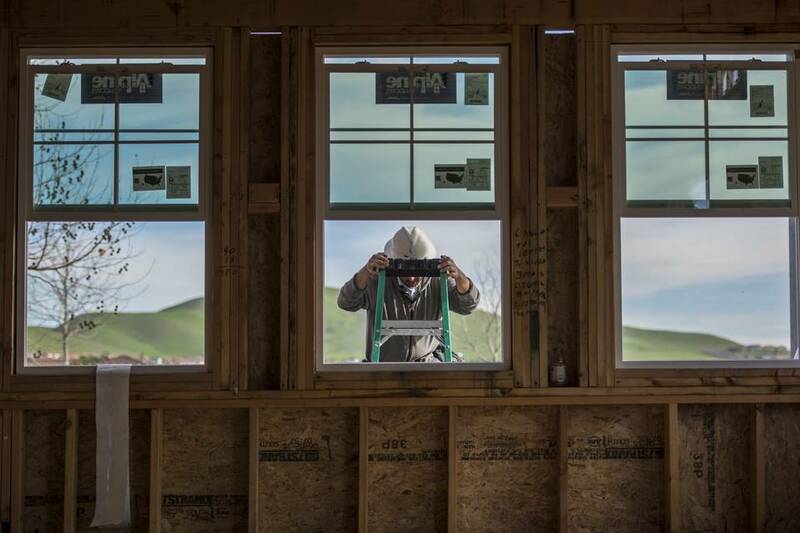 Housing starts in areas such as Solano County, home to Fairfield and Vacaville, remain nearly 40% below the levels of a decade ago. But unlike the early years of the recovery, when builders focused mainly on premium homes in pricier core locations, local and national builders in the Bay Area are trying out these more distant markets in the hope they can attract buyers who can’t afford sky-high prices in coastal cities. The trend is more pronounced in the Bay Area than in other parts of the country because of the extreme price pressures over the last few years. The Bay Area has had some of the swiftest job growth in the country and among the lowest unemployment rates of any major metropolitan area. But there are signs that demand for higher-end homes is slowing: Median sales prices for new single-family homes in San Francisco fell in both May and June, though prices were down from a record high of $1.5 million in April, according to data from CoreLogic. Publicly traded builders TriPointe Group Inc. and CalAtlantic Group Inc. are selling in Vacaville, about 55 miles northeast of downtown San Francisco, while Meritage Homes Corp. and D.R. Horton Inc. are promoting developments in Manteca, 75 miles east of the city in California’s Central Valley. Meg Gore, a vice president of the Sacramento division for Taylor Morrison Inc., said she has seen more purchases by both commuters seeking affordability and retirees looking to cash out of the Bay Area and get more space. As a home builder and land developer, Gregg Nelson of Trumark Companies has seen firsthand how demand has shifted outward in the recovery. Coming out of the recession, the company largely focused on condominium projects and land deals in the core San Francisco and Silicon Valley markets. But in the last three years they have begun work on two larger single-family home developments on the periphery—one 40 miles east of San Francisco, the other 80 miles east. The closer project is in Dublin, a fast-growing suburb that is adjacent to the easternmost stop on the Bay Area Rapid Transit line. Homes there will start at under $900,000 and range above $1.5 million—not “affordable” compared with most any other U.S. market, but lower-priced than new-home developments closer to the city that can start at $1.5 million. The project farther east, in Manteca, is just now getting off the ground, and its homes are expected to start at about $350,000. Most builders wouldn’t have dreamed of venturing out so far two years ago, Mr. Nelson said, but nowadays the calculation is changing.